Mexican food had been the subject of conversation for many months among my circle of friends. 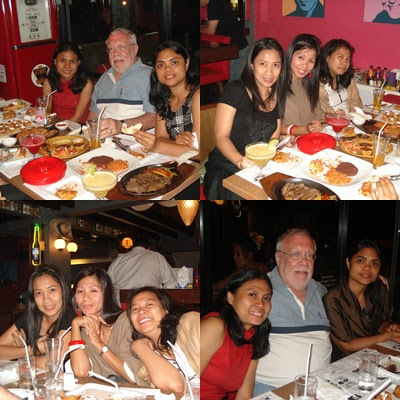 There is one place foreigners frequent on Sukhumvit Road so Mags suggested we go. Due to our schedule differences going Mexican with every one in our group seemed impossible. Then came the big day, the 13th anniversary of Mag's 25th birthday. Figure that out! 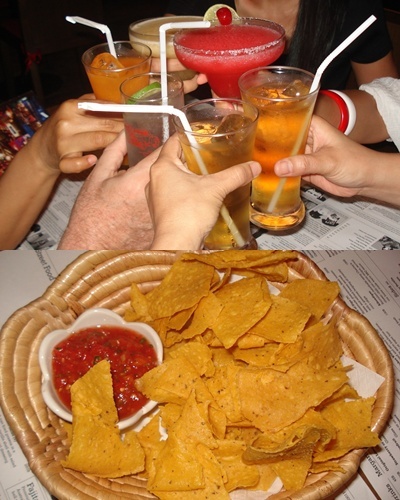 It didn't take much convincing when Mags said we celebrate it at Charlie Brown Mexican Restaurant on Sukhumvit 11. The six of us went. We were greeted by David, the manager of the restaurant, as we arrived. The tables were booked. We were told. We didn't know that booking was necessary before going there but the manager was kind enough to give us a table. We were ushered to our seats after David and a waitress put two tables together. 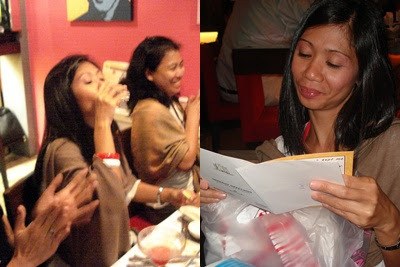 We ordered drinks and while sipping them, we busied ourselves discussing what to eat. After a long conference, we hailed a waiter to order. Nachos were served first. 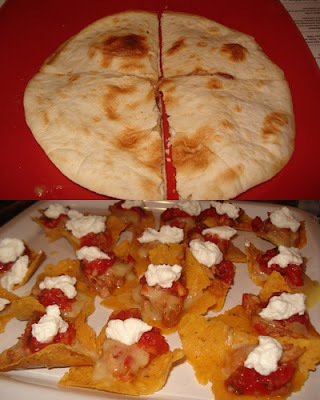 Only after a few moments of munching nachos, there came the parade of the entrees. People looked in amazement when our orders arrived. All main dishes were served with Mexican rice and refried beans. A toast for the birthday girl! The paper menu served as the placemat. Economical. Our two non-Adventist friends savored lemon and strawberry margaritas. This Chicken enchalada was chicken-filled corn tortilla topped with spicy enchilada sauce. I ordered this Chimichanga. It was deep-fried tortilla filled with beef topped with ranchero sauce, guacamole and sour cream. It was delightful. 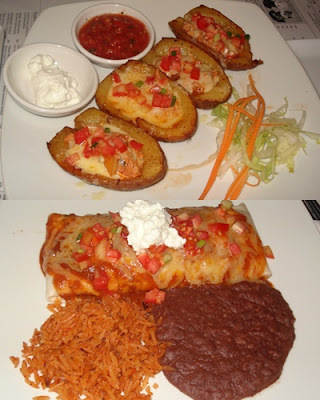 Seafood is not the distinctive feature of Mexican cuisine although it is a common part of cookery in states that border the Pacific Ocean or Gulf of Mexico. I wasn't surprised when I took a bite of this breaded fish.It was not satisfying. I will not order it the next time we visit the restaurant. These potato skin were filled with chicken , topped with cheese then grilled. They were served with sour cream and salsa. They were fantastic! Pictured below was beef burrito. Mags ordered this Fajitas. 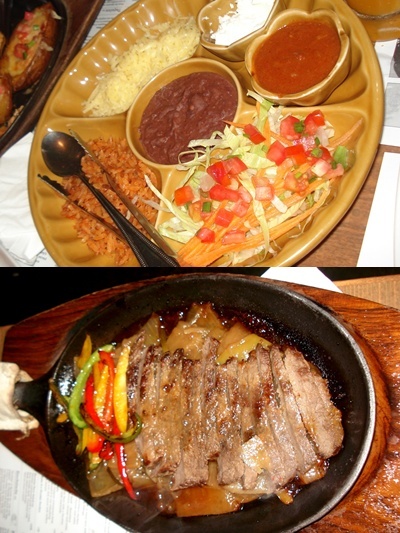 The beef served on a sizzling skillet came with a plate of caramelized onion and bell peppers. It was exciting to eat this as you choose your own stuffing and sauce and roll your own tortilla. I only had one serving of this because I really didn't like the texture of beef. I think tortilla would be yummy even without meat in it. This simple yet savory quesadillas was one of the best dishes we ordered that night. It was oozing with melted cheese when sliced. The best part of our dinner was this tuna-filled nachos topped with sour cream and cheese. They were just divine. 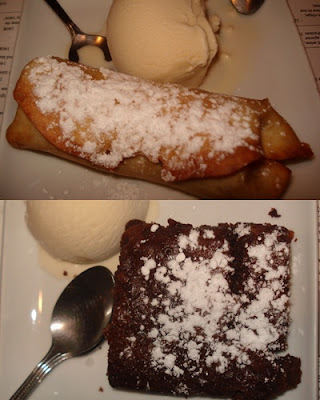 As for dessert, we got ourselves a plate of apple and cinnamon fruit cobbler and brownie. Each was served with ice cream. The cobbler was not bad but the brownie just fell short of pleasing our palate as it lack the characteristic of the classic brownie which was moist, luscious with a firm, velvety texture. While waiting for our food, we asked if the restaurant offer something special for birthday celebrants. They did. According to the manager, a "Mexican cake" was given to the person who celebrates his birthday. We were shocked when the"cake" arrived. It was a glass of tequila with a small candle in the middle. As we were cheering her, Mags gulped it down. The night was young so after dinner we walked along Sukhumvit Road. The sudden downpour made us flag down a cab and go home. It was a wonderful birthday celebration.